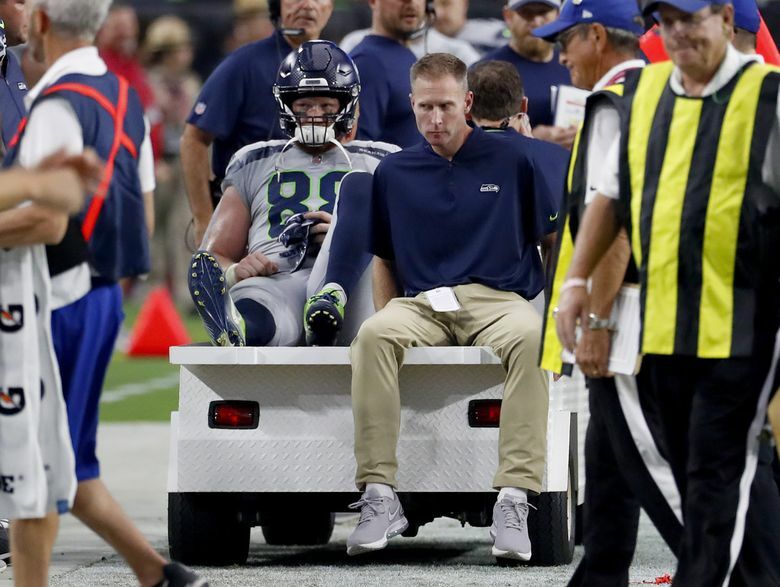 Seahawks lose former UW tight end Will Dissly to injury early in first quarter against the Arizona Cardinals. Per a report, he is done for the season with a torn patella tendon. Will Dissly’s promising rookie season — one in which he seemed on course to surpass even the most realistic of expectations — came to a sudden end Sunday at Arizona when he suffered a patellar tendon injury in his right knee. Dissly was carted off the field with 7:52 to play in the first quarter, injured after making a catch for a 5-yard gain when tackled by Arizona safety Antoine Bethea. The injury, which is the same one suffered by Jimmy Graham in 2015, is expected to sideline him for the rest of the season. The injury leaves Seattle with just one healthy tight end on the 53-man roster: Nick Vannett. Earlier this week, Seattle waived Darrell Daniels to make room on the roster for defensive end Branden Jackson, who was needed for depth to short up that injury-riddled position. That forced the Seahawks Sunday to use a few formations that featured backup left tackle George Fant as an extra blocker and eligible receiver. Seattle will likely re-sign Daniels to the 53-man roster and Seattle also has Marcus Lucas on the practice squad. The Seahawks also hope to get free agent signee Ed Dickson — who has been on the Non-Football Injury List with a quad injury suffered in offseason training — back after the sixth week. Dissly was Seattle’s second-leading receiver in terms of yards entering the game with 151. The Seahawks selected him out of UW in the fourth round of the 2018 NFL draft.